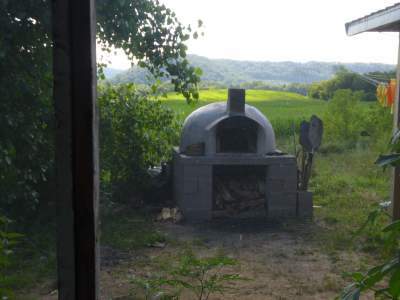 We went off to visit the ACRE artists’ residency in western Wisconsin. It’s the “Driftless” region of the state, where the glaciiers did not pass. The lovely rolling hills of this farm country make a pleasing rural setting for the residency. It’s built by an architect who is very into salvage. Large beams of old growth wood from Chicago’s tear-downs have been used to build the lodge buildings, and an airplane hangar was disassembled to make the cafeteria and workshops. My talk took place in a kind of screened in area with the artist residents seated on bleachers salvaged from a high school. It was performative, and concluded with Dara Greenwald’s wonderful short film, “Tactical Tourist”. We met Claire Pentecost and Brian Holmes as they emerged from tubing down the river next to our “rustic cabin” — (that means cold shower, brr!). The next day our host, Dan Wang, took us on to Viroquia, where we visited the massive Driftless Books store in an old tobacco warehouse. Back in Madison, we saw the famous farmers’ market around the state capitol building. Had to buy a shopping bag… Wisconsin has a very strong local food culture, and we were happy to visit large sprawling cooperative supermarkets in Viroquia and Madison both.